If you're planning to do any Melbourne sightseeing then you've come to the right page first! ......and show you how you can get help on the city streets when you can't find something. Don't miss this valuable info. It'll make your Melbourne visit an easy to get around free adventure. Come here to the Melbourne Visitor Centre first to stock up on all the free maps and guides you need. You can also get free internet access here so you can re-find my website if you've forgotten any of my tips and recommendations! ......see how close they are in the photo - you can't miss it! It's open daily 9am-6pm, 9am-5pm on Good Friday and closed Christmas Day. You can also pick up maps and brochures and get info from the Melbourne Visitor Booth. 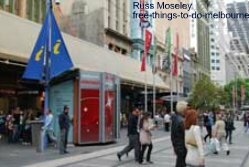 It's located in the Bourke Street Mall (between Swanston and Elizabeth Streets) opposite Myers. It's open 9am-5pm Mon-Sat and 10am-5pm Sunday, closed Good Friday and Christmas Day. 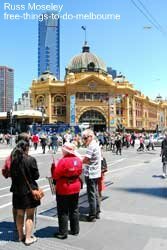 The Melbourne Greeter Service should be on your must do list if you're going to visit Melbourne. ..........This doesn't seem to be a very well publicised tour but it's really good. 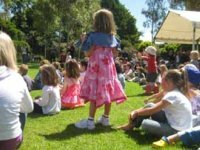 Read about the tour I took at Melbourne Greeter Tour. Be sure to call up and arrange an 'orientation'. It's available in 8 languages - English, Swedish, German, French, Dutch, Italian, Spanish and Japanese. 24 hours notice is required. 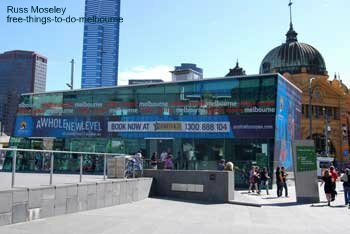 The meeting point is the Melbourne Visitor Centre in Federation Square. You'll almost certainly see red uniformed people, often standing on street corners. These people are volunteers provided by the city to answer visitors questions. No doubt the most usual questions are "Where is......?"!! They are however apparently a wealth of knowledge about things to do in Melbourne so don't be shy, they want to help! You'll see them between 10am-4pm Mon-Fri and 11am-2pm on Saturdays.